ABOVE: Kapellbrücke (Chapel Bridge) and water tower. Lucerne (Luzern in German) may be Switzerland's most popular tourist destination. It's an essential stop on European bus tours that spend a day or two in Switzerland, and no wonder: the scenery is breathtaking, the town is dotted with medieval structures, shopping opportunities abound, mountain and lake excursions are nearby, and attractions like the Verkehrshaus (Swiss Transportation Museum) make Lucerne a magnet for Swiss daytrippers and foreign visitors. It would be easy to dismiss Lucerne as a tourist trap, but that would be a mistake. The things that make the city popular also make it worth visiting--even if you're an independent traveler who normally eschews the beaten path. This bridge is located near the junction of the river and the Vierwaldst�ttersee, or Lake of the Four Forest Cantons (also known as Lake Lucerne). 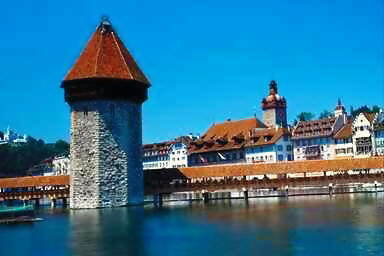 The bridge bends as it leaves the shore, then angles across the river past a stone Wasserturm (Water Tower) that is believed to have once served as the lucerna, or lighthouse, after which the town was named. The Kapellbrücke--"Chapel Bridge" in English--was built in 1333. As you cross its 200-meter length, you'll see 120 captioned triangular paintings from the early 1500s that chronicle the city's history. The paintings feature St. Mauritius and St. Leodegar, the patron saints of Lucerne. In reality, the bridge isn't as old as it looks. The Kapellbrücke was nearly destroyed by a 1993 fire, and much of what stands today is an excellent restoration (or reproduction, if you're a cynic or uncompromising realist). Tip: If you're prone to arachnophobia, you may want to wear a hat and walk quickly when crossing the bridge at certain times of the year. Large spiders have been known to spin impressive webs in the Kapellbrücke's rafters--and that's something else you won't read in the tourist brochures. Downriver, between the Kasernenplatz and the Mühlenplatz, the Spreuerbrücke or Mill Bridge zigzags across the Reuss. This bridge, which was constructed in 1408, features a series of medieval-style 17th Century plague paintings by Kaspar Meglinger titled "Dance of Death." It has a small chapel in the middle that was added in 1568.